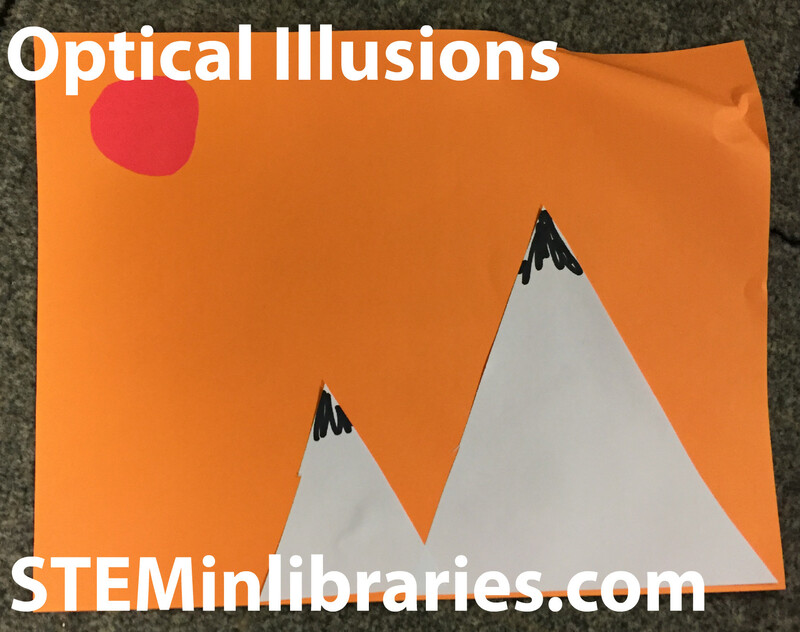 Brief Description: Learn about optical illusions, and create some of your own! Pre-select Optical Illusions to show during parts of the program. 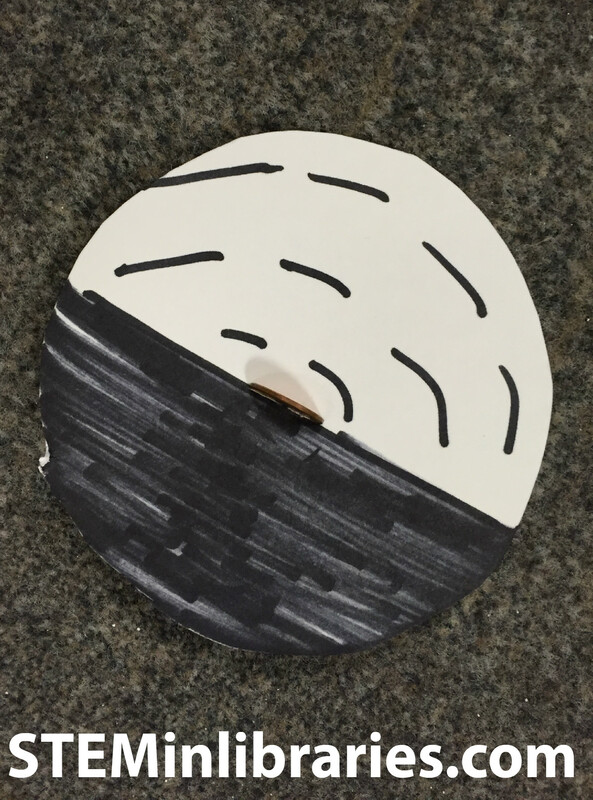 Cut circles out of white cardstock paper, and cut small slits in the middle of them, large enough to fit a penny or pencil in. 3. Provide explanation of how optical illusions work. We read the “Before You Begin” chapter of the book Simple Optical Illusion Experiments with Everyday Materials by Michael A. DiSpezio as explanation of the science behind Optical Illusions. 4. Show several optical illusions from a book. We selected a variety of illusions from the book Amazing Optical Illusions by IllusionWorks to show. 5. Try the “hole in hand” illusion. 6. Show several optical illusions on the computer. We found the University of Washington’s Neuroscience for Kids website, the Kids’ Page of the National Institute of Environmental Health Sciences Illusion section, and What is an Optical Illusion? on Optics4kids.org useful. 9. Make the Fish Out of Water craft. We did the experiment as described on Hole in Hand Activity on Eyetricks.com, using pieces of rolled paper as our tubes. We did the activity as described in the book, reading the explanation provided as to why the afterimage occurs. We did the activity as described in the book, reading the explanation provided as to why the colors appeared as they did. We did the experiment as outlined in Optical Illusions- Try This at Home: Fish Out of Water from the Maryland Science Center’s website. 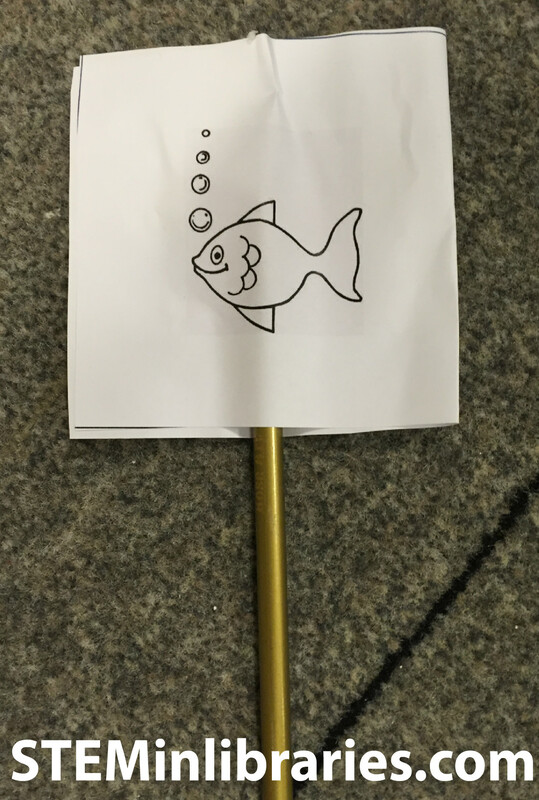 Since the instructions on the website called for participants to draw their own fish and goldfish bowls, we opted, for the sake of time, to have pre-printed handouts ready. We created the handouts using the Fish Making Bubbles free coloring sheet on Freecoloringsheets.net and the Simple Fishbowl Outline Clip Art from Clker.com, and merging them into our own document. Optical Illusions- Try This at Home: Fish Out of Water from the Maryland Science Center’s website. This was an interesting program. Optical Illusions, by their very nature, are sometimes difficult for people to see. With some of our activities, participants were unable to replicate the desired illusion, which caused some frustration. Next time, we would be sure to emphasis that although the illusion works for most people, there are always some for whom it doesn’t work. Additionally, we had minor issues with the Color Spinner. The penny was hard to insert into the color disc, and often would go loopside in its slot, making it hard to spin. It might be worth substituting pennies with tiny golf pencils, to use as the spinner. This program was very solidly for grades 1-3, and we do not believe that it would work well for either younger or older audiences.